Shindig! magazine is an eclectic cornucopia teeming with obscure TV and film, psychedelia, folk, garage rock, folk rock, progressive rock, funk and soul. 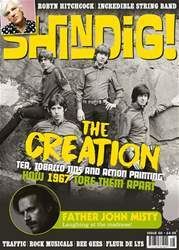 Expect to find a treasure trove of intriguing tales in the magazine teeming with stories from the golden ages of music. Shindig! is the forum of choice for those who worship the forefathers of modern music. Join the community and enjoy a magazine teaming with the glories of 60’s and 70’s music, film, tv and much more! Legendary clubs, festivals and events, counterculture and everything in between is covered as well, with devotion, dedication and integrity. Over the last 20 years Shindig! has amassed a loyal following of readers from all walks of life, join them today! The tea, tobacco tins and action planning, how 1967 tore them apart. Shindig! magazine was born in 1992 as a cut and paste garage-punk fanzine by the name of Gravedigger. A few years later, it was reinvented as Shindig! as a homage to the TV show that took The British Invasion of America and laid the foundations for the awe-inspiring music that followed. Andy Morten joined the team in 1997 and helped the magazine reach newsstands across the world. Shindig! celebrated its 50th issue in 2016. Shindig! magazine was created in honour of rock’s forsaken royalty and all the weird and wonderful bands that make the genre great. It covers everything from pot smoking country-rock bands to heavy duty led zep purists. Bass slappin’ funkateers to flare cut glam rockers. If it rocks Shindig! covers it. Each issue takes pride in stringing together the seminal moments from the iconic past of rock music. Furthermore, it introduces you to our favourite new and upcoming bands that build upon the work of the legendary rock gods. Join the Shindig! community today.